According to Mario Batali, there are two types of Italians, people who are Italian and people who want to be Italian. My husband Alan wants to be Italian. He loves the Sopranos and the Godfather 1 & 2, fine Italian suits and shoes. He dreams of owning a Ferrari. He loves Barolo and Chianti, prosciutto and spicy sopressata, taleggio and mozzarella, and anything covered in good marinara. He enjoys watching Lidia’s cooking shows with me and has been known to spend a Sunday afternoon watching a few episodes of David Rocco’s Dolce Vita. Drooling, as David Rocco takes us on his escapades through Italy, as he drinks red wine in small juice glasses and eats simple Italian food. Rocco takes us to all the places Alan reminds me “we’ve never been!” – which translates to anywhere in Italy. We will go someday. For the moment, this love of all things Italian takes us hunting in New York City for a famous meatball. An avid reader of Vanity Fair, GQ and Esquire magazine, my husband always finds food articles that spark his need to go to New York City. After learning of the critical acclaim Frankies Spuntino’s meatballs received, we were on a mission. Our drive into the city was fast and easy on a Saturday morning. Once parked, we schlepped our way from SOHO to Clinton Street to Frankies. 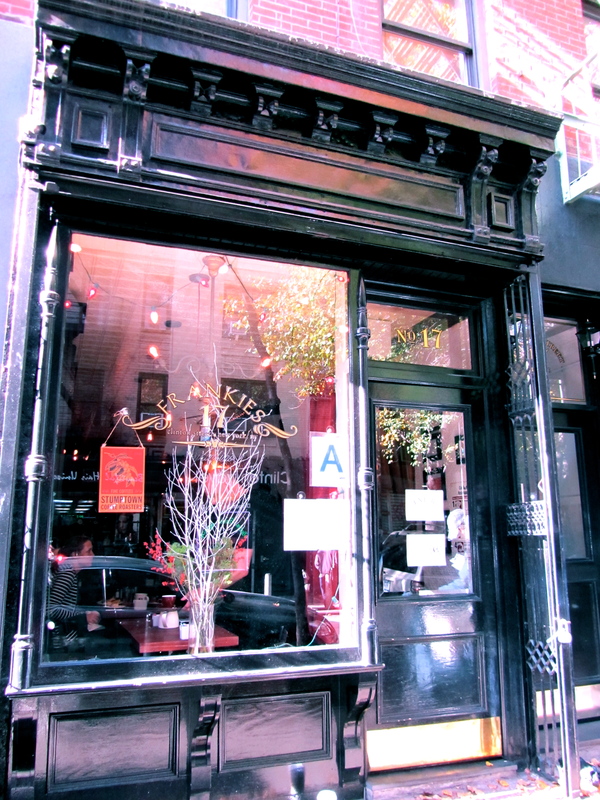 Founded in 2004 by Frank Castronovo and Frank Falcinelli, their original location is in Carroll Gardens, Brooklyn. They have since opened two locations in Manhattan and written a cookbook, The Frankies Spuntino Kitchen Companion & Cooking Manual. 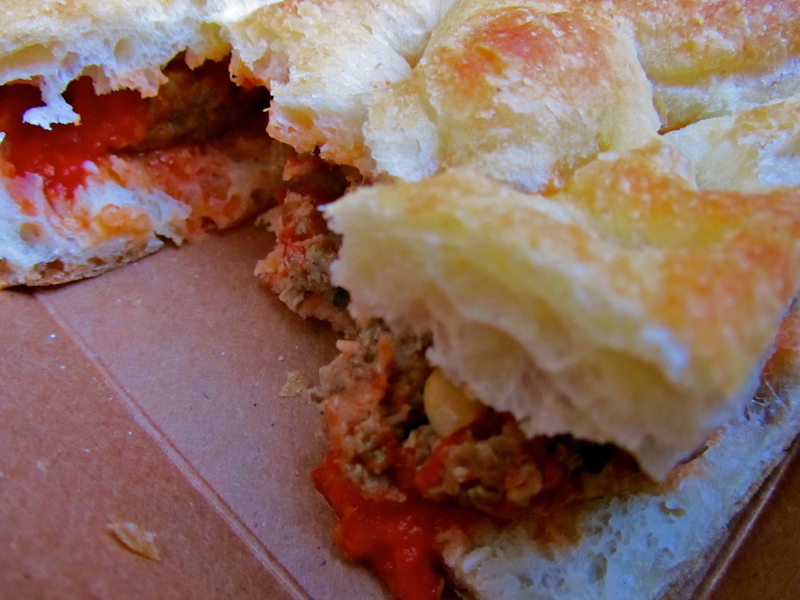 Upon finding the restaurant, we grabbed two meatball parm sandwiches and ate them in seconds sitting on a stoop on the street. With tomato sauce dripping down my sleeves, I could understand what all the fuss was about. 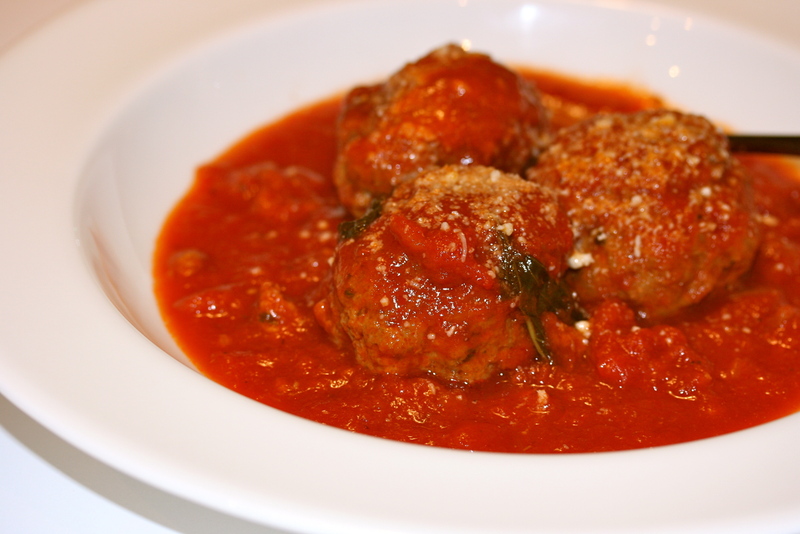 Raisins and pine nuts were peeking out of these moist meatballs. They were uniquely delicious. Ladled with simple marinara and served on crunchy salted focaccia bread, we washed them down with an ice-cold Coke and headed back to SOHO to enjoy the day. Mission completed and highly recommended. Upon further research, I have found Frankies meatball recipe in Bon Appetit. I’m amazed at how much garlic they use in their sauce, 13 cloves! The sandwiches didn’t satisfy our meatball cravings completely, so I decided to make some for dinner the next night. My meatball inspiration comes from Anne Burrell. She gives two pieces of advice for making meatballs. First, add water to your meat mixture. It should feel pretty wet and squishy and it makes for a really moist meatball. Second, before you form your meatballs, make a little test patty, fry it up and eat it! This is a great way to see that your meat mixture is super flavorful and you can adjust seasonings as needed. Here’s my adapted meatball recipe. Trust me, they’re really fantastic! In a large stock pot, add a little olive oil and sauté the onion on medium heat until translucent. Add the garlic and stir until fragrant, about a minute. Pour in the tomatoes and add the water. Add the spices, wine and basil leaves. Give a really good stir and bring to a strong simmer, then reduce to a gentle simmer and allow to cook for a few hours – the longer the better. Taste along the way to check for reseasoning. Remember to remove the bay leaves before serving. * I always use Cento brand tomatoes. They have Chef Cut style and I really like their consistency. I know we all have our allegiances to specific canned tomato brands… use what you like best. * Be sure to taste the sauce after about an hour of cooking. The acidity of the canned tomatoes can really vary. If the tomatoes are very acidic, a little sugar will do the trick. I generally will reseason as it cooks, adding a little more wine, salt and pepper, etc… Once you add the meatballs to the sauce it will take on a delicious, rich flavor. Remember, whether you’re just making the marinara or both the meatballs and sauce, the longer it cooks the better it will be. Add a little olive oil to a frypan and sauté the onions until they soften and become translucent. Add the garlic and stir until fragrant, about a minute. Add some salt and pepper and a pinch of red pepper flakes. Stir and remove from the heat, allow to cool. In a large bowl, add the ground beef, bread crumbs, Parmesan cheese, parsley and eggs. Using your hands, squish the mixture around. Add the cooled onion mixture, season with salt and pepper, squish again. Begin to add the water, a 1/2 cup first and squish. Continue to add more water (a little at a time) as needed until it begins to feel quite wet. You might not use the whole cup of water. Make a little test patty and fry it up in the pan you used for the onions (no need to dirty another pot). Once it’s cooked through, taste it. It should be really yummy! If it’s not flavorful enough add a little more salt and/or more Parmesan cheese. Make the meatballs the size you like. We like them to look like golf balls on steroids. I prefer to just bake them in the oven and then add them to the pot of sauce. If you grew up frying them first, feel free. Roll the meatballs and lay them on rimmed sheet pans. Bake them in a 350 degree oven for about 30 minutes, until they feel firm. Remove them from the oven and add them to the sauce to finish cooking. Simmer in the sauce for at least an hour, preferably two or more. The longer it cooks, the better. * The reality is, meatballs are work. If I’m going to the trouble to make this, I make a lot. You could cut the recipe in half for both the sauce and meatballs, but why bother? They freeze beautifully and they’re so good. You can have spaghetti and meatballs, meatball sandwiches, meatball pizza, or just more meatballs. You’re far more cultured than a peasant! You might want to check out Frankies Spuntino recipe for sauce. He uses 13 cloves of garlic! There’s a link to it in the post. They sound absolutely scrumptious and I intend making them very soon. I love your blog and keep them coming. Thank you so much! Let me know how you like the meatballs. They’re really yummy! I’m glad you’re following my blog and enjoying it! Unlike Jackie and Ricky I probably won’t be making meatballs, but I will enjoy you making them for me (one of my favourites). Nance, your writing style is fantastic. Felt like I was reading a food article in GQ our something like that.